Pre-orders are now accepted by the Royal Canadian Mint for its 2014 $100 Grizzly Silver Coin, the second release from the Wildlife in Motion series of $100 silver coins that sell at face value. This 99.99% pure silver series debuted in May with the 2013 $100 Bison Silver Coin for $100. It was limited to 50,000 and quickly sold out, suggesting the possibility for a similar result with this newest coin considering its appealing design and identical mintage. Claudio D’Angelo’s reverse design captures a Canadian grizzly bear in the midst of a hunt. The grizzly, head turned and a large trout held firmly in its mouth, appears patrolling in a shallow river stream along a Canadian landscape. Surrounding the image are inscriptions reading ‘CANADA’, ‘2014’ and the coin’s legal tender face value of ‘100 DOLLARS’. Obverse designs show Susanna Blunt’s portrait of Queen Elizabeth II. Encircling inscriptions include ‘ELIZABETH II’ and ‘D.G. REGINA’. Each coin has a serrated edge, is struck to matte proof quality, has a weight of 31.6 grams and a diameter of 40 mm. With its weight and purity, every $100 Grizzly Silver Coin has about 1.016 troy ounces of silver content. That brings its melt value to $23.35 at the latest spot price of silver at $22.98 an ounce. 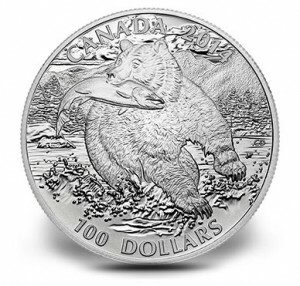 The 2014 $100 Grizzly Silver Coin is available for pre-order to Royal Canadian Mint Master’s Club members. These are customers who have spent more than $999.99 in Royal Canadian Mint products in a consecutive 365 days based on the first date of purchase. Coin News Update: Ordering opened to everyone on Monday, September 23. Ordering is expected to open for everyone in a few days. Visit www.mint.ca for updates. 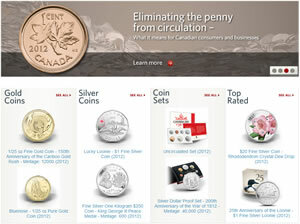 While these $100 silver coins sell at face value and are GST/HST/PST tax exempt, the Royal Canadian Mint does charge for shipping and tax on shipping. As another benefit to Master’s Club members, they are not charged shipping within the United States and Canada. 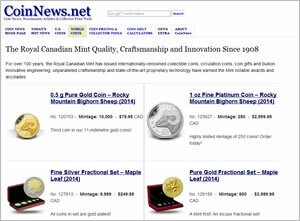 The Mint is not expected to begin shipping the coins until December. There is certainly a massive amount of detail shown on this coin. Which seems to give it somewhat of a 3D effect. Wondering how it will translate in the actual production. Quite a tempting piece of artwork up for grabs. We’ll have to see what kind of numbers the Master’s Club members will leave us after the smoke clears.